WARNING! You are approved for a full principal forgiveness of your Home Equity Account. | The Law Office of Emil Fleysher, P.A. WARNING! You are approved for a full principal forgiveness of your Home Equity Account. | The Law Office of Emil Fleysher, P.A. Home Blog Bankruptcy WARNING! 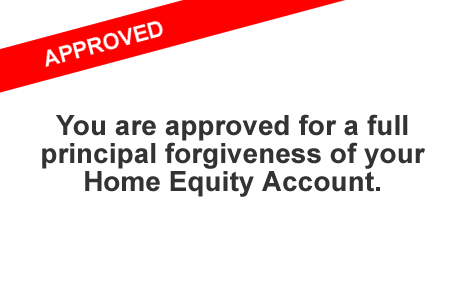 You are approved for a full principal forgiveness of your Home Equity Account. WARNING! You are approved for a full principal forgiveness of your Home Equity Account. A client recently came in to my office with a letter she received from Bank of America stating that her Home Equity account had been approved for participation in a principal forgiveness program offered as a result of the Department of Justice and State Attorneys General global settlement. The letter goes on to explain that the entire balance and any accumulated fees, interest, etc. is being forgiven. At first glance, and for many borrowers, this is a wonderful blessing and a sign that the banks are really doing the right thing. However, this letter raises some serious red flags that borrowers and the public need to be aware of. Selection: My client that received this letter never asked for any assistance with her 2nd mortgage and is not is not in a position to modify her first mortgage. In other words, this “gift” really has no benefit to borrowers in my client’s position (of which there are many). This principal forgiveness program would make more sense and help the economy and housing market if it was offered to borrowers on the edge who could really be saved by such a gift. For example, consider a homeowner that has a 1st mortgage for $200,000 and a 2nd mortgage (Home Equity Loan) for $50,000 on a home that is only worth $150,000. The homeowner knows that he is paying more for his house than it is worth and more than he would have to pay in rent for a comparable home. This is the typical borrower that, sooner or later, will wind up in foreclosure. However, if this homeowner were granted principal forgiveness on his 2nd mortgage, he would be close enough to a “break even” in his home’s equity position that keeping the house and paying on the 1st mortgage would make economic sense. Thus, saving the house from foreclosure and saving his creditors from a bankruptcy that would likely follow the foreclosure. Unfortunately, the banks appear to be forgiving the principal on a random and unsolicited basis. Tax Consequences: In this case, I advised my client against accepting the offer (which, by the way, is automatic unless you contact the bank within 30 days and affirmatively reject it). A borrower that is in foreclosure because the property is hopelessly underwater will often benefit from a bankruptcy to discharge the deficiency balance and any additional debt that may have resulted from the events leading up to foreclosure (2nd mortgage, medical bills, credit card bills, etc.). In bankruptcy, these debts are discharged once and for all when the bankruptcy case is concluded and debts discharged in bankruptcy are not subject to any taxation. However, if a borrower does not reject this offer of principal forgiveness prior to filing for bankruptcy, that borrower will receive a 1099-C at the end of the year which is a form that turns the forgiven debt in to taxable income. Do you see where this is going? Many borrowers who derive no benefit from the principal forgiveness nor have ever requested principal forgiveness may end up owing money to the IRS which is not dischargeable in bankruptcy for at least 3 years. There is a law that protects borrowers who receive 1099-C income from their primary residence but this law is set to expire on 12/31/12. In short, the principal forgiveness letters may bring joy, happiness, and salvation to many borrowers, but unforeseen and unaffordable tax obligations for others. A serious shortcoming of the settlement is that there is no mechanism for directing this aid to borrowers that would most benefit from it. If you have questions about foreclosure, loan modification, bankruptcy, or other alternatives, please feel free to call my office at 954-484-9987, send an e-mail to emil@fleysherlaw.com, or complete the contact form below.